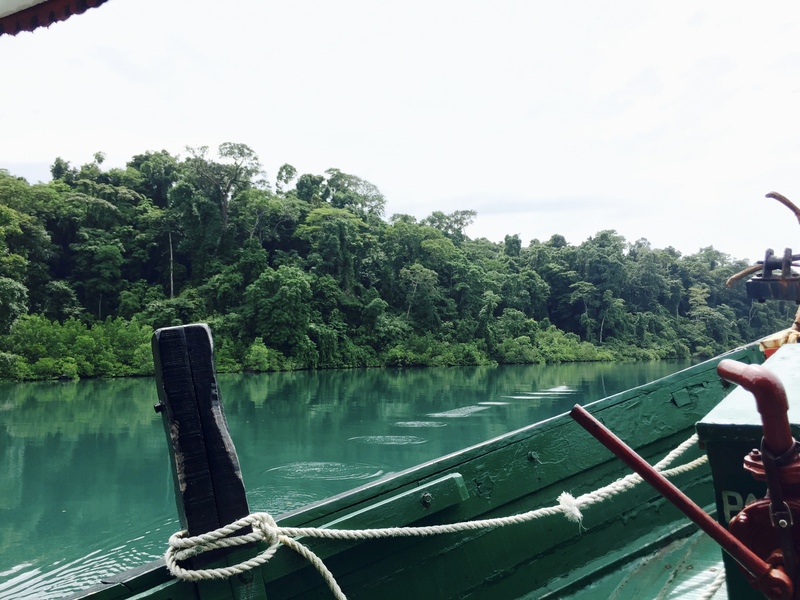 Last week our group travelled to the Andaman and Nicobar Islands, an archipelago that belongs to the Indo-Burma biodiversity hotspot. A biodiversity hotspot is a biogeographic region that has lost at least 70% of its original habitat and has a high amount of endemic species (species that are native to the region and not found anywhere else in the world). I considered this trip my ‘fall break’ for the semester. It was, literally and figuratively, a deep breath of fresh air amid a hectic study abroad experience. We not only removed ourselves from the polluted air of India’s urban mainland, but also completely disconnected from the outside world due to the complete lack of Wi-Fi and phone reception. Even though we attended lectures and learned about biological and conservation concepts, this experience still felt like a break. I had not felt as in touch with nature as I did in the Andamans in a really long time. 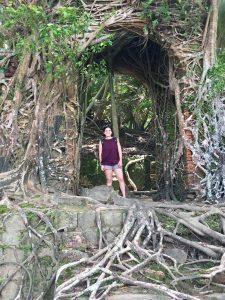 As a conservation biology student, India has been a fascinating country to explore. I have studied the ways in which pollution, human population growth, and rural-to-urban migrations have affected India’s terrestrial ecosystems. However, before our trip to the Andamans, I was unfamiliar with aquatic ecosystems and their conservation. Fortunately, we delved into these topics during our interactions with the Andaman and Nicobar Environment Team (ANET). ANET is a group of professionals who research environmental issues and promote island conservation. They research biology and social science topics and educate the public (including visitors like us) on conservation measures to protect the islands’ ecosystems and communities. We spent two full days learning at the ANET base in the North Wandoor Village of South Andaman Island. Our first lecture, taught by marine research officer Mahima Jaini, explained the types of forests found in the islands. 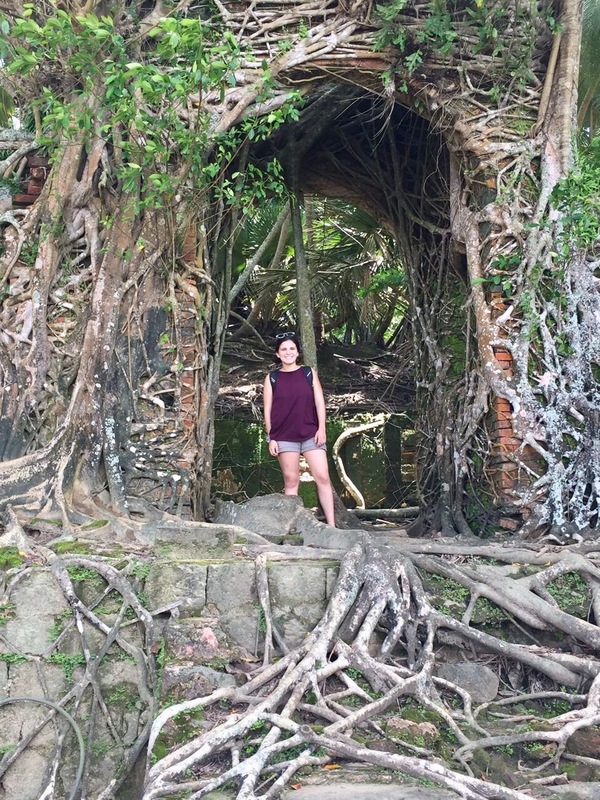 After the lecture, we walked barefoot through a mangrove and observed the organisms that we had just learned about, such as the different mangrove roots, mudskippers, and fiddler crabs. After our excursion, we returned to the base and had a lecture on coral reefs, my favorite topic of the visit. Not only did I expand my conceptual knowledge on coral reefs, but also experienced them firsthand during our weekend excursions to North Bay and the Mahatma Gandhi Marine National Park. Before coming to India, I knew some basic facts of coral reefs. However, since I have never taken a marine biology course, most of my coral reef knowledge came from brief news articles and science museums. I knew that climate change was contributing to the destruction of the reefs and that coral bleaching was one of its effects. However, I was unfamiliar with the scientific reasoning behind this phenomenon. Fortunately, we had two lectures on coral reefs, one given by ANET and the other one by Dr. Paradise. My newly developed interest in these rich marine ecosystems, which are slowly being destroyed by human actions, inspired me to research more about their nature and conservation. Coral reefs are ecosystems comprised of coral animals that house 25% of all marine life. There are two types of coral, hard and soft. Each individual coral animal is called a polyp. Hard coral polyps are organisms from the phylum Cnidaria that extract calcium carbonate from the seawater to create an exoskeleton, they are the ones responsible for expanding the coral reefs. New polyps construct their exoskeletons on those of their predecessors, through budding or dividing. What we commonly refer to as corals, are colonies of thousands of polyps that have grown over long periods of time. However, polyps are not the only organisms responsible for the magnificent beauty of coral reefs. Most corals live in symbiotic relationship with algae called zooxanthellae. In this relationship, the zooxanthellae use the corals for shelter and the corals use the zooxanthellae to feed through photosynthesis as well as to obtain oxygen and remove waste. For coral reefs to survive and thrive, several environmental requirements are necessary such as saltwater, clear water, clean water, and warm water… but not too warm. The coral reef must be at a depth shallow enough, and in clear water, for sufficient sunlight to reach it. Sunlight is essential as it is one of the main requirements for photosynthesis by the zooxanthellae. Additionally, the water temperature should fall between 23 and 29 degrees Celsius to avoid thermal stress. Lastly, the ocean’s pH must be basic to encourage proper coral growth and development. Global warming negatively impacts all these factors. Human activities on land, such as burning fossil fuels, industrial production, raising livestock, and deforestation affect life at sea. The accumulation of greenhouse gases in the atmosphere is ‘buffered’ by the ocean, as the immense water body absorbs excess heat. However, despite the ocean’s contribution of slowing down global warming by absorbing atmospheric heat, the ocean’s own chemistry is being greatly affected by it. Ocean changes as well, as other climate change effects, directly impact coral reef ecosystems. Because of my interest in chemistry and thermodynamics, I researched how water temperature, sea level rise due to heat, and ocean acidification affect coral reefs. Rise of atmospheric heat, due to increased carbon dioxide emissions, causes heat to be transferred into the ocean, increasing its overall water temperature. A higher temperature of the environment in which corals live causes them to face thermal stress. Under high level of stress, the corals expel the zooxanthellae. Without the photosynthesizing algae, the corals lose their food source and become white and vulnerable to other diseases. This process, called coral bleaching, results from the terminated of the symbiotic relationship between the coral and the algae. The corals can recover, but for this to happen, the stressors must be reduced for the algae to return. Sea level rise is not only caused by the melting of ice caps and glaciers, but also by thermal expansion of the ocean. Just as heat causes materials to expand because of the increased kinetic energy of its molecules, the increased greenhouses gases in the atmosphere cause the ocean to expand when it absorbs their excessive heat. Expanded ocean levels increase the depth at which corals are found, consequently making it harder for sunlight to reach the corals and therefore harder for the zooxanthellae to properly photosynthesize. Ocean acidification is also caused by increased levels of carbon dioxide in the water. Over the past 300 million years, the ocean’s pH has averaged 8.2. However, due to global warming and the increased emission of greenhouse gases, our ocean’s pH has decreased by 0.1 pH units. A more acidic aquatic environment disrupts the growth of corals by damaging their exoskeletons. A lower pH prevents the corals from absorbing calcium carbonate from their surroundings to continue growing. Besides the effects of global warming, other threats such as overfishing, pollution, invasive species, coral mining, and ecotourism contribute to the destruction of coral reefs worldwide. I am fully aware that my presence, and consumption, in these islands had an ecological impact. Therefore, even though I came to the Andaman and Nicobar Islands as a conservation biology student, I was very conscious of my interaction with the Andamanese wildlife. During the last two days of our trip, we visited two locations that had coral reef ecosystems: North Bay Beach and Red Skin Island (inside the Mahatma Gandhi Marine National Park). I noticed a huge difference among the two ecosystems, the coral reef at Red Skin Island looked significantly healthier. Even though I did not see coral bleaching or visibly dead coral at North Bay, the amount (and size) of fish and other marine species was minimal. One the other hand, at Red Skin Island I saw a huge variety of organisms. Through our glass bottom boat, I observed dozens of different organisms such as bright violet clams, black and purple sea urchins, different varieties of sea cucumbers, clownfish inside their anemones, over four different types of coral, and even two enormous napoleon fish, which according to our guide, are rare to spot! 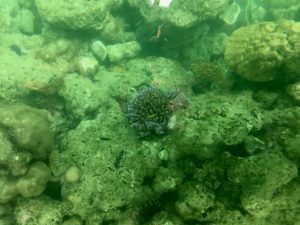 Contrastingly, during the glass bottom boat ride at North Bay we probably saw less than four species of fish and maybe one or two sea cucumbers and urchins. Despite the stark contrast among the reefs, I was not disappointed with any of the boat rides. 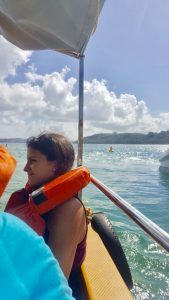 Both allowed me to experience two different coral reef ecosystems in the Andaman Islands that I can now compare to each other and to other coral reefs that I visit in the future. 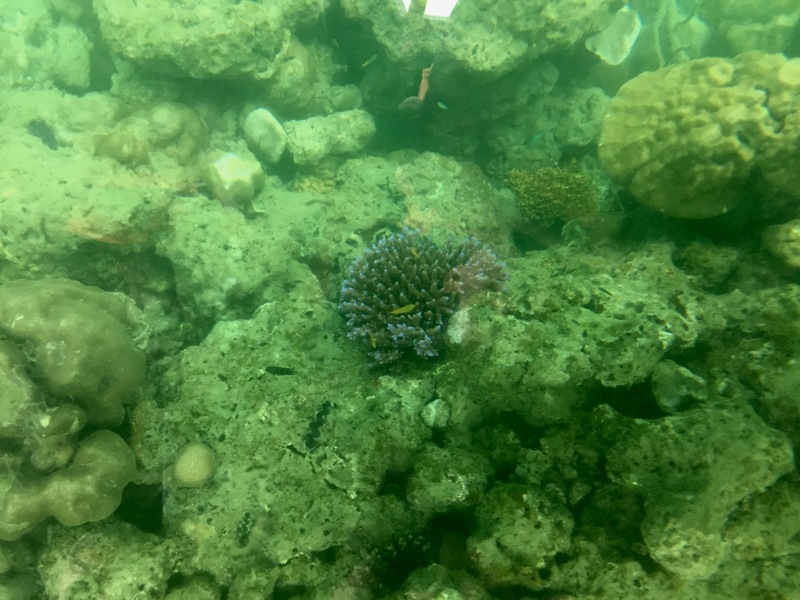 One difference between these two locations in the Andaman Islands that probably impacts the reefs greatly is the amount of tourism and activities present at these spots. Because Red Skin Island is inside a National Park, the conservation measures in place were much stricter than those at North Bay. For example, all our plastic water bottles were confiscated before entering the Mahatma Gandhi Marine National Park, and there was only one vendor inside selling only snacks and juice boxes, no water bottles. Contrastingly, North Bay had dozens of food, drink, and souvenir vendors, and huge piles of plastic water bottles dumped behind the bathroom area. Now that I have visited two coral reefs in India, and learned a little bit about their conservation, I want to continue exploring this topic. I am looking forward to our trip to Goa, as we might get to see the endangered coral reefs there. But for now, I will make sure to inform my friends and family about the impact that our actions have on coral reefs, and the measures that we can take individually to support these extremely biodiverse ecosystems.